The charts are an absolute disaster right now. I've looked at roughly 20 million charts this weekend, but there are so many possibilities, it simply becomes confusing to try and cover them all. This update was a whole lotta work for very little tangible reward. I looked at everything from NDX and COMPQ to SPX, INDU, BKX, and TRAN -- but there's nothing that jumps out as "this is the one!" The market keeps us guessing at times, and this is one of those times. At times like this, it's sometimes better to zero in on other indicators, such as trendlines and so forth. I think one of the key trendlines right now is visible on a longer-term chart, and it's not too far below the current market. 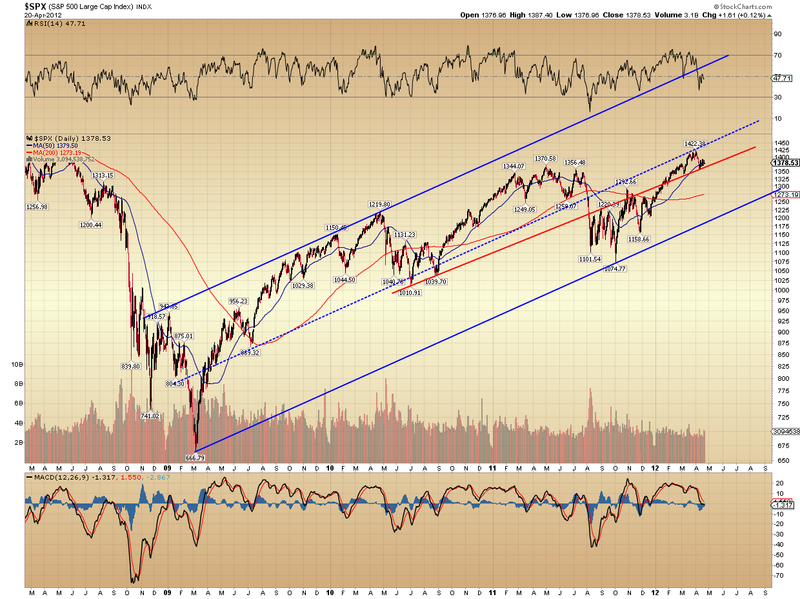 If that red trendline breaks, the market could start the next big leg down. If it doesn't break, the market should continue to bounce higher. As I mentioned, there are literally too many options to list -- so I'm going to present my "best guess" short-term outlook and if it works, it works; if not, so be it. First off, it does appear that the SPX formed an impulse down on Friday, so I would expect a bounce (which may have ended already, into Friday's close), followed by another impulse down. Backing out a few degrees, here's what the best-guess counts looks like. Again, if the market materially breaks the trendline mentioned in the first chart, then all bets are off for the more bullish count. The bearish option is a very wild flat for wave (2). The market has never allowed us to rule out the alternate wave (iv) count (meaning the last decline could have marked the bottom of wave (iv)). The INDU has shown more strength than the other indices of late, and the potential exists that it's forming an ending expanding diagonal fifth (and final) wave. This option is shown below, and would jive reasonably well with the SPX triple-zigzag bullish count shown above. 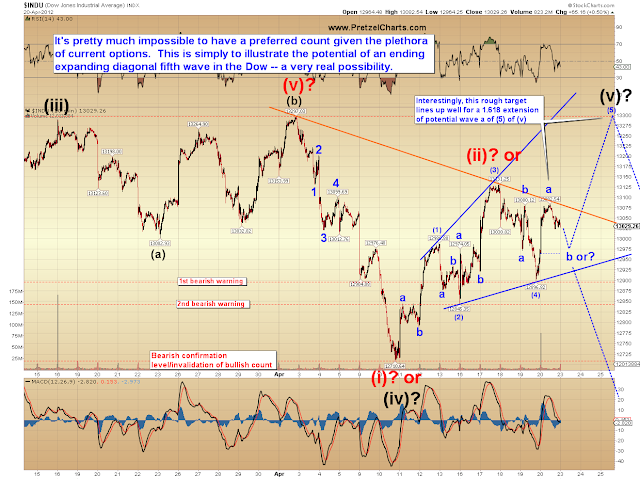 The other option, of course is that wave (ii) completed at the recent high. Interestingly, the NDX looks like the weaker sister, no doubt due to Apple's recent fall from grace. Unfortunately, this chart presents much the same mess as everything else, though possibly more so. However, the alternate count in NDX calls for a rally almost immediately there, so what happens Monday should be telling. It's always possible for NDX to decline while INDU/SPX rally, especially if funds decide to rotate out of tech and into blue chips. A factor that's always worthy of attention is the upcoming Ben Bernanke Beard Expose, which occurs on Wednesday, though tickets went on sale last week. Thanks to my new beard, I'm able to get in free as an exhibitor! Anyway, at 12:30 on Wednesday, the FOMC announcement takes place, during which Ben will tell us about all the "tools" the Fed has at its disposal -- including hammers, screwdrivers, and their latest addition: a belt sander. He'll also probably tell us "no QE3 today!" So maybe that's what the market's waiting on before it starts the next serious leg down. The more bullish "best guess" count would fit a potential rally into Tuesday/Wednesday, so we shall see. In conclusion, there's too much clutter in the charts to make a strong call right now. I've done my best to present what appear to be the "most probable" short-term options, but still could very well be completely off, since I can literally count at least 7 other potentials without really trying. We're simply going to have to see what happens over the next couple sessions to allow the short-term options to be narrowed down a bit, unless one of the two presented works out. In either case, it still appears quite likely that the whole rally is corrective, and should ultimately resolve with lower prices. Trade safe. Good afternoon to you, sir. as you predicted, the market got a little more interesting after you went to bed on Friday. The Fed doesn't have a jointer planar? Who am I going to get to build me a treehouse? thanks B_E. did he mention natural gas? In according to "dont get greedy" I sold my possitions Euro short, SPX short now, will read your Sundaypost now with pleasure and see then what it looks and feels like for today :-) Thank you PL. 1.314 target reached... looks like more room to fall, though. If my count's right, Euro should be getting ready to take another dive off the 1.3154-1.316 zone. Right on schedule. Back above 1.31560 now and euro/usd shorts could be in trouble... otherwise, should be smooth sailing lower. Europe markets down already ~2.5% across the field, guess the further drop should happen in the afternoon during US trading session. sound (for example, make it louder)." Nelson Elliott described the third wave as a "wonder to behold." These waves are relentless in their buying or selling and are strong and broad across the board. The trend in an EW3 is unmistakable. Yep, 3rd waves are the only true "easy money" in trading... as long as you're on the right side, of course. Euro/usd looking like a 4th wave triangle now. Should resolve lower. INDU is finding a lot of resistance right now.. On IchiMoku 4 hrly at 12917, on daily IM at 12920 and a line going back to 2 may 2011 (prior top) at 12928. So if it stays above and moves N we have some more highs to come. It ian't over yet. Looks corrective. (Lowest was 12905). SPX got within sniffing distance (1363.8) of IM resistance at 1362.4 and a line going back to the prior high 2 May 2011. NDX has closed the gap at 2652. So we should be going up 'real soon now'. dito, flat too took the 59 looked funny. Thx y posted your revised targets!!! gone all weekend and just returned....looks like my bgz....faz....qid....spxu... and tza are alive!!! Katxo, how do you do that timing thing you do? Like "It has to go down within 15 minutes or I'm out". When you trade do you have a picture of what the chart should do and then pull the plug or change your view if it doesn't? So it's more than just having a target, you have a target and a trajectory? Like with the dow just now, it bounced off the bottom twice, is that why you covered your shorts? Even though it then went to two more lows, you still knew it wasn't behaving like a 3rd wave in full force? Is that it or am I missing something? Dr Frankenstein would be proud. Trade setup on GLD...."Inside candles" last two weeks. High side = long at $161.94 (that's not gonna happen), Low side = short at $158.33. Looks like easy money. MACD is near Zero, Directional indicator crossed on 3/9 signalling move to the downside. You are not missing anything and very perceptive. All done with EWs on numerous charts [and smoke and mirrors]. See my discussion on Superpositioning of wave structures. If the 3 minute is finishing up an impulsive EW5 and the 15 minute is recording a believable EW5 at the tgt and the 120 minute is recording an EW4 [this is what happened, discussed this all weekend] and the DAY is recording either an EW3 or 5 [as now], and there is a believable ABC in the EW4 of the 120 minute then we can predict that an EW1, 2, 3 of the (5) will unfold. I labeled the EW1 and 2, we are in the 3 now, I got out of my trade as: 1) I had to drive to work; 2) openings tend to be bullish; and 3) greediness is not rewarded in the mrkt, especially in ES trading. My posts about it has to go down within 15 minutes is me watching the EW action, either it conforms with the count I have, or if it goes above certain level -- you have seen these posts too -- is will break that. It was behaving [and is] as an EW 3. Had to drive to work, point number 1 & 2. Ouch...sorry to hear that. Married 40 plus years......good thing she found me. Your greeting makes me want to put on a toga. This is why I got out of ST ES trade, did not want to wait for the last nickel. Well look at that open. I'm grabbing a glass of water and going back to bed. Wow! Let's go surf tsunamis! I wonder how all the GM IPO buyers feel about the "fair market value" pricing of that offering today? Thanks "SkyPilot"....even blind squirrels find nuts once in awhile. Where'd I put my cane? Oh, well that's easy enough then .... Really appreciate the reply, just have to go and buy some more IQ. it was a 3rd wave in full force, reset on the 3 minute is what bothered me. We are down 1.25% since Friday, think that qualifies as a EW3. You ask good questions, perceptive. . . I would be careful with interpreting the mrkt with the DOM in this way. Ppl place bids either high or low to try and pull mrkt one way or another, then remove them suddenly. Ohh, wait, that is illegal, placing a bis solely for the purpose of influencing the mrkt direction with no intention of buying or shorting. See 58 tested and broke? With sooo many relying on your calls PL.....I suspect the internal battles you have about "what looks right" are kinda like thermal nuclear war. You have my deepest respect and admiration. Thanks Bob. It can be challenging. lol -- I love watching that happen all night on DX. You'll see *massive* bids at certain price points -- we're talking 20% of the total volume traded showing up as a bid... then it vanishes and the market tanks, or vice-versa w/ asks. yeah, illegal to place bids one does not intend on carrying out. But how can anyone prove that was the case? Oh, yeah, it's da bomb. All you can eat buffet, free beard grooming... plus, if you can get through the reporters, you can usually corner Ben and get him to autograph a box of his signature color of "Just for Ben, Beard and Mustache Dye." WMT is hammered. Mr. Clean bribed in Mexico and covered up. Do they know what ethics is inside America's boardrooms? Yikes. PL, Excellent call on Friday when you almost confirmed that the net leg will be down based on Friday's movement. Is it too early to put any targets for this move or can we expect to see 1340 in SPX? does this big opening gap down have to be filled soon? (soon meaning within the next few days) or not? I sold AAPL May 550 put at 20.40. Earnings are tomorrow, implied vols will come in after earnings announced and 50 day MA at 569, so think AAPL will find support 'here'. Not trading advice. If vols come in and stock goes up, I win twice as put value will crash. Thanks. 1340 should be very reachable. Possibly much more... I'd like to see a confirmed five wave decline to rule out a few options before getting too over-confident. The majority of gaps are filled with 90 trading days -- so there's not necessarily a rush on gaps. We used to have a poster who was pretty good at gap calls named maverich. Haven't seen him around in a while, though. would sure like to see 1.30 broken decisively............i dislike the euro very much............socialists!! Looks like that crazy flat wave is the correct interpretation. It was hard to have confidence in it because it violated guidelines regarding the length of the b-wave. But the squiggles all added up, so I couldn't throw it out. It definitely qualifies as one of the weirdest flats I've ever seen. yes......she busted down thru her 50day ema at 565...........im seeing 545 and 525 as poss support although i have no position so easy for me to say.......NOT TRADING ADVISE!!! It seems that we are all trying to read the signs of the market to determine whether it will make another wave V up or whether it will start a new impulsive 5-wave down to break below 1340 SPX and beyond. Do you have any alternative IT count that implies a "hovering" stance between 1410-1330 for several weeks (perhaps gradually moving to the lower side towards June) before continuing a more sustained move upwards from June-July till the elections? Thanks for taking the time to post a short & brief reply if you have the time! Looks like $505 to $510....is next target. Thanks for that PL. I've been trying to figure out what it's doing. For the RUTTERS on here. Possible bear flag building for the next hour or so. A break should take it below 783.56 imo. Maybe it will take till tomorrow. Or if the Katzo progression works 140-180-140-220. Sorry if that is wrong Katzo. AAPL's weekly has an implied volatility of 98. That means it can have a swing of 13% up or down in a week. It can be 500- or 600+ from today's price level. this is what I'm looking at right now CM.... the other markets are bouncing so ... we'll see soon enough. SDX. On this evidence we're still going up. 3 good touches on the lower trend line, 6 on the upper. I don't draw theses charts, the market does, I just join up the lines. Any thoughts anyone... ? What do you make of entering the cloud? I do not know Ichi Moku very well but does that portend anything? What's your co-worker saying now?! short May SPY 137 calls, long 138 calls. Max loss = about max gain... pretty good for selling an OTM spread! Good Doctor...you are the Itchy expert! What's it telling you? Looking for a 5 wave C up now? Hi B_E, first touch of candle to Cloud should bounce out pretty smartish. Could take a day or two to clear but unless it is a very strong downward push SPX will bounce out. On my homemade count it still scores only 60/129, same as yesterday, same as indu. NDX has increased from 38 to 58 so a ways to go just yet. IMHO :) I can't do COMP but will know tonight, it usually precedes NDX. 24 hr charts MM so that's why I guess, time will tell if it's all a ball of chalk! what was y tgt on AAPL, 555? Thanks Katzo. I could not find that info I saved from you. Thanks again for all your insights. Since they have not been working lately it might be time that they do. Great call! Now AAPL is back at 571, almost looks like that drop never happened!! People are buying aapl up like crazy, expecting good earnings I supposed? Well, looks like I was early and left some potential on the table, but I still think this will work out. Plus it's very small (1 contract) so i'm only going to make or lose a couple hundred bucks either way. The implied vols will come in no matter what the stock does after the earnings announcement. And with it down over 10% from the high going into earnings, they would have to really stink to disappoint at this juncture, imo. Just got my copy of Frost and Prechter. I opened it up to the first page and my apartment was instantly a balmy 85. I can smell saltwater and volcanic ash. Do I have to move to Maui for this stuff to work? 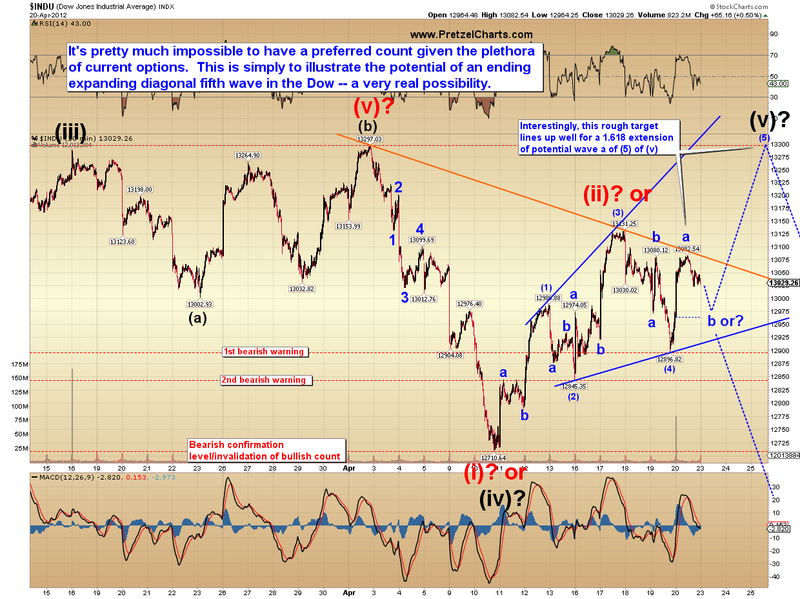 IM counts are now INDU 76, SPX 57, NDX 53 and COMP 63 as usual ahead of NDX. Ticking up but not frantic. Have to let the waves unfold......looking at your chart on the Dow Jones, can easily count five down and so far a very clear a-b with c unfolding now. 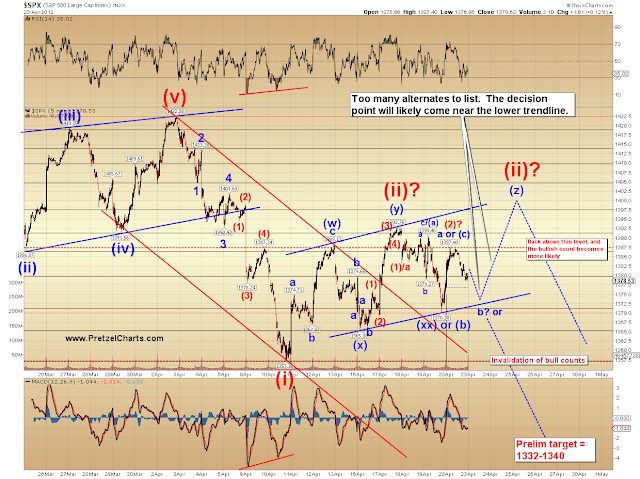 Once we have a wave one and two, then we can do some calculating with a clear stop at the old Dow Jones high. Could they be that nice to us? I want my money back from AMZN b/c mine didn't come with any of those effects. Figures I'd get a dud. Few weeks ago there was a nice debate in this blog about trading leveraged ETFs. I mentioned the existence of a company developing swing trade strategies with indices ETFs, but did not remember the name. Well, I found it: it is called Oxynos (www.oxynos.com). Their solution is AI-based (algos). If the results they post for long/short trend following strategies with US equity ETFs (my interpretation of what they do...) are reliable, their case is compelling, specially for the leveraged ETF scenarios. The site contains few month performance charts (both leveraged and non-leveraged ETFs) for the past 3 years. I've asked for mored detailed info, will share if/when I receive it (apparently they serve only 'institutional' investors like hedge funds and family offices). Here's BP, a large international oil company traded in UK and US. If it shows a 5wv complete 1st wv then it will bounce as shown. This will take time, so I don't think we're in for a big move down anytime soon. Could be wrong, just IMHO, but .... it is a quiet market: - so here come the fireworks. Up. Update from Nenner on Nat Gas. The latest decline took SPX from 1387 to 1359. We then saw a bounce from 1359 to 1365.50 which is a 23.6% retracement of the aforementioned decline. It now looks like we are starting to go back down. By EW rule, does the current move down have to exceed 1359? Price is hitting its head on the 50 DMA on the 15 min chart as well. May get a headache and throw in the towel. As for me, the general consensus is that the 1340 is key. 1338 would be a 0.382 retracement from the 1202 to 1422 move. Any new thoughts after today's action? things is B_E that by saying '5w down, unfolding a-b-c you are calling the TOP right?...I can set my longstops at 13000 yes? IF...we are in wave 2 back up, and if the 30 min a-b up from 4/9 is complete, then the c wave up should unfold in five waves. If we are starting the five waves up from 12,845, then the only calc we can make right now is if this C wave (of 2) equals A then 13,265 would be top of wave 2. Stops would be at old high at 13,297 if going short at 13,265. Hi Katzo7, do see 1340 area as eventual pivot point? Even short term? I can't trade in and out every day, but I can trade dead-cat bounces or a Wave V up. In the long run where d'ya see Au B_E? Some say we've topped out and are going down, Dr Nenner say $2,500. Gotta be 10% to the good now....gonna stick around? but the Top is in IYHO right? Damn C waves, catch me out every time. NDX and SPX are pinging straight back out of Cloud. Typical. COMP is stuck it seems. Cloud is rubbery (bounces) and viscous (you can get stuck)... Somewhere along the line the candles will drop thru' then pop up to the underside, That will be when the downside Really Gets Going. Just IMHO. Time will tell. Bob_E, what wave is CVX in now? Nenner says close to a low on Gold..his date is 5/4. Also said it had to hold P&F trendline. I'm of the opinion that CVX is still in a complex correction wave 4. That wave five is yet to come. 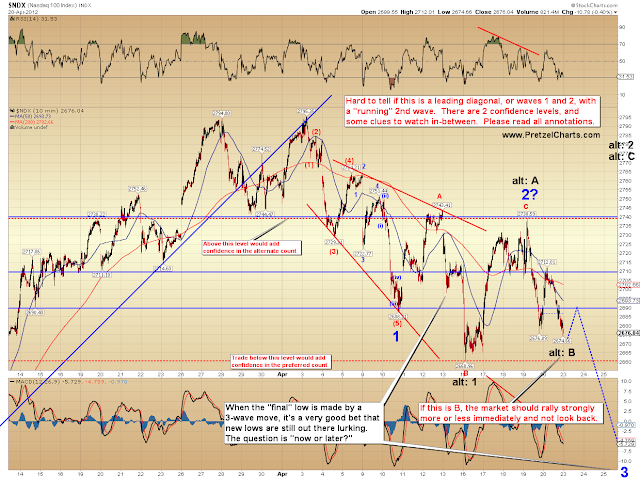 From March 23 thru April 2 I'm thinking that's wave 2 and that's a simple correction. Rule/guideline of alternations suggests this wave 4 is complex then. Breaking below $100.51 means wave five is underway. Crossing up and thru $105.00 approx means I'm wrong. 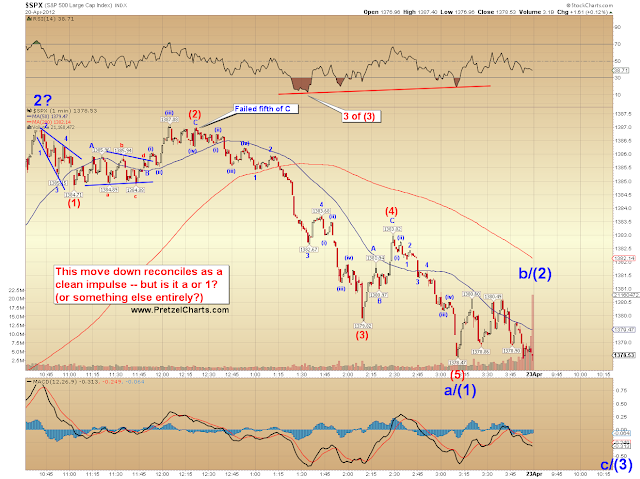 There are, as PL points out often, many variations within EW analysis...waves can be read many ways. I think I'm right, but have my mental stops at $105...approx. I belive the top is in...I hope the top is in. But the old adage that comes to mind is "hope is what you have, when you can't face reality" The one thing I know for sure is: This is exciting! Hi B_E, sorry: didn't get my thinking cap on. RE INDU: WXY is my favoured count, not a flat. ZZ commonest in wv 2, and both sets are zz. So, abc W abc X abc Y.... then down (unless: it throws in abc Z) Can't yet say. To clarify. they do a lot of damage, they're 3rd waves... ouch. Prolly headed to 68 to 72 ES to put in an EW4 on the 120 chart up there before any more down. this will run into EOD so choppy till tomorrow. . . Many ways to look at "the waves" The Dow Jones seems to be dancing to it's own tune, obviously because of the limited number of issues associated with the index. Thanks Bob. I've been on the verge of jumping back in a couple of times today but so far I've restrained myself. It doesn't seem like it wants to go back down so I'm thinking it might go higher before it goes lower. Time will tell. If it hits PL's number of $104.50, then I'll get back in with one or more puts for sure. that is their job. . . Here is the chart I'm working off of. It's actually setting up a bullish candle for the day and looks like the MACD is about to cross the signal line. I'm wondering if a call might be in order? INDU 12,924 S/R line going back to 2 may 2011 was too strong as posted this AM. INDU has tried on 15 days to break it but failed. Should now bounce nicely to get enough momentum down to burst through... we'll see. But it will need Some Energy to get through which implies a big bounce. IMHO. I can wait good doctor, as they say "fortune favors the brave"
Tradem like ya see em 4runner....earnings coming up on 27 I believe. do it well too! How do you see PSX or ES as you know it by proxy K7? I'm thinking if we assume a flat which is now starting 'C', this wv could well be 1.62 X A, which thus tops at 1410.. is that where you're looking? I see more risk to the upside after the big move down into earnings. But yes without a directional bias, selling straddle or strangle would accomplish that play on vols declining. Well, I didn't get an order in so I'll either be a happy camper in the morning or I'll be kicking myself. Either way you're alive and well...and nobody is shootin at ya over in Iraq,Pakistan or Afghanistan. It's all good. Blew my strategy badly by panic sell early in pre-market. Short 3 TF and planned to keep one no matter what but when futures sank 60 very early AM, I sold all and left alot of money on the table. I told myself not to do just what I did. Nothing wrong with a decent profit but this could have been make my month day.